BabyOrganix's Member can earn 150 Points! 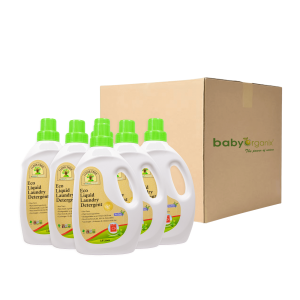 BabyOrganix O’Clean Laundry Powder is the laundry powder with Zero ‘O’ nasty ingredients, protecting your home, safer for the environment and yet remove the toughest stains on your baby clothes and diapers. Your family’s cloths come out naturally clean, fresh and residue-less after every use. As a result our powder is kinder to your skin and safer option for sensitive skin, and safer to the environment. We believe it s important to reduce your exposure to potentially unhealthy chemicals such as Optical Brighteners, Phosphate, Chlorine Bleach, Enzymes, Dye and Formaldehyde Super-concentrated and low suds formulation perfect for all machines. Easy rinse formulation to prevent redepositing of stains and dirt during wash.
Natural based ingredients, easily biodegradable, safer for your home and our planet. Suitable for baby clothes and even your delicate. Remove all solid waste from soiled nappies before soaking. For soaking, use 1 scoop to 5 liter of water. After soaking, nappies ready for hand or machine washed. Without optical brightener, triclosan, phatelates.